The complex is no good for disabled people. We did not find out until 2 days before we were due to fly that there are no lifts at this hotel. We made the best of it, even the surrounding area is all hills. The local cab drivers are very rude and unfriendly towards disabled people like myself. The hotel staff were very good and the food was ok. We ate out a lot as hotel food was more or less the same every day. We had to buy some of my favourite whisky to drink as the stuff in the hotel was horrid. Hotel tip: Ask for a room on the ground floor. 5 of us went for a cheap break to this hotel, the staff made us welcome from the start, the food was ok there were plenty but it did repeat itself. We didn’t have great weather but we drank at the hotel every day. The bar staff were very fast no waiting. All in the entire hotel was great for what we paid. It was cleaned every day. The pool was scrubbed, so don’t listen to the bad reviews. On arrival at the hotel things looked promising, but very quickly went downhill. The cleanliness of my room was bad; dirty floors and no brush to sweep it myself, the settee in living room was in an awful state, dirty and torn (good job there was only me and my husband so we didn't have to use it), lock on patio door was broken, cupboard doors in kitchen were hanging off. mould on bedroom ceiling and of course cockroaches. There was a note in the bathroom saying if we wanted clean towels to put the dirty ones in the bath and they would be replaced; we did this but they kept on re-hanging the dirty ones! The pictures of the rooms that the hotel have on their website are nothing like the room we stayed in. The only good things I could probably say about this hotel are that the breakfast selection was good and the location of the hotel, which is about a 10/15 minute walk to the main bars and beach. Good - excellent pool, huge apartment, great sea views, excellent food. We were lucky enough to be a on a day flight so got there in time for lunch. It doesn't look much from the outside as it is situated in the old town which is pretty run down now (however it's just 15 minutes walk into the new bit and taxis are really cheap). 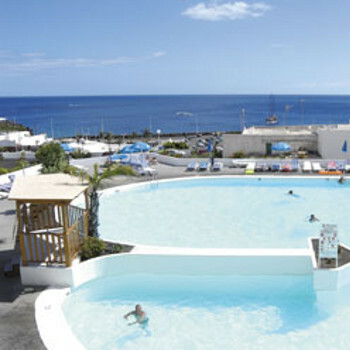 However the pool area is great and all rooms have sea view. Had to wait for 2pm before we could get into our apartment and had I not had a headache I would have happily sat in the sun taking in the views! We were on the 3rd level so had to haul our cases up several flights of steps, bearing in mind how much we ate though the exercise did us good. The apartment was huge and a had a living area, well kitted out kitchen, big bathroom and bedroom. No air conditioning but the fans did a very good job and we left the windows open at night so had a breeze. All rooms have a terrace/balcony to sit on. Rooms are very dated and in need of a major overhaul but were clean and spacious. All staff were very friendly but a bit reserved and did their best to look after us. There is table service in the restaurant which we aren't used to, in other AI hotels you seat yourself and get your own drinks. Food is easily the best bit of the holiday. There is always a good choice and everything is cooked to perfection. Breakfast was a fry up along with cold meats and cheeses, jams and at least 5 types of bread plus more pastries, cereals and fruit. Lunch was a variety of salads, a fish dish, pasta dish, 2 lots of vegetables, potatoes or rices in different variations and at two meat dishes. Pudding was various jellies, cakes, fruit, ice cream and custard type desserts. Dinner was same as the lunch but with at least one more meat dish. The pool bar is open 10-21 and the pool was huge and a pleasure to swim in. The only downside is there aren't enough beds as it's a large complex and there isn't any shade at all and hardly any parasols. Myself and partner spent a week all inclusive at the Aquarius and found it really good. The rooms are very spacious although a bit basic. The pool and area surrounding it was fantastic,with no broken tiles etc as reported on other reviews. The only down side was the lack of decent entertainment, which we found terrible unless you like parrots, bingo or a quiz...! Couldnt understand why there were no pool games for kids or even the adults?? As its such a large fantastic pool? All that was on offer were pool and darts comps in the day time. Would go back to the Aquarius as the location is fantastic and brilliant value for money. I agree with most of the prevous comments on this hotel. Its main attraction is its location. Close to a good selection of evening entertainment, live music etc. It overlooks the harbour. You won't starve at The Aquarius (especially if you liked school dinners). Housekeeping do a good job of changing the sheets loo rolls etc but they need to work harder on clenliness. We did return from the pub to find cockroaches in our room on a couple of occasions. The staff take a rather casual attitude to this problem. We did notice an aerosol of insecticide under the sink when we arrived and had to use most of it. Lanzarote, I'm told, has a problem weth them at present. There's a lot of road / drainage work around the town at present. If you want to walk to the beach during the day it's abuot fifteen minutes walk - lovely beach sunbeds and shade 8 Euros. Don't bother with the three hour glass bottom boat trip it was rubbish, instead walk along the coastal path (about three miles) and get the water taxi back. cleaners are fastest ever about 2 mins per room. made beds, cleaned bathroom and changed towels. carried brooms and mops but dont think they used them. location directly up from small marina, pleasant stroll into main resort. staff friendly and courteous, always have a smile when working, especially Manolo at the bar. andreas the entertainer was always doing his best and even after being thrown in the pool by a drunken englishman at night still managed a laugh. Visit on a regular basis. Find position exellent for attractions & all the best restaurants are close by. Try bourbon street for evening entertainment, just afew minutes walk from aquarius. Could be more modernised but position makes up for this. Plans to revamp apts in future. Ended up at this apartment after a two week stay at Hotel Ficus, Costa Teguise after i was unable to travel home due to one of my kids being ill. However i was shocked at the standard of accomadation. when i drove up to the place it looked very nice. The staff at reception were extremly helpful and asked if i could take a seat until they sorted out the paperwork. This is where it all changed. I sat on the couch in reception. I think i would have been more comfartable sitting on a peice of lava rock. Anyway off to my room i went(room210). As i passed around the edge of the pool i noticed that it was very deep, if i'm correct in saying 1.65m at the shallow end. The water was murky and i struggled to see the bottom of the pool. I climbed the stairs to my room, which may be an issue for the elderly and into my room i went. It had a worn out sofa bed and one chair, patio doors over looking the pool and a large balcony which was a sun trap with four chairs and a patio table. There was a strong smell comming from the toilet. The bath had no enamal on the bottom. The taps dripped all night and i had to put plugs in the sink and bath in an attempt to stop the stench. The bedroom was clean and tidy with plenty of storage. The next day i made my way to the large sun terrace which gets the sun all day long. The terrace is made of concrete and is breaking up in several places which is very uncomfartable on the feet. The poolside bar was very expensive (10 Euro's for 3 soft drinks) There are plenty of bar's nearby and small nice resturants in the oldtown. The main beach is about a 20 minute walk from the hotel as are all the larger pubs and resturants. Overall i would rate this accomadation as poor and in need of refurbishment and in need of a good clean.